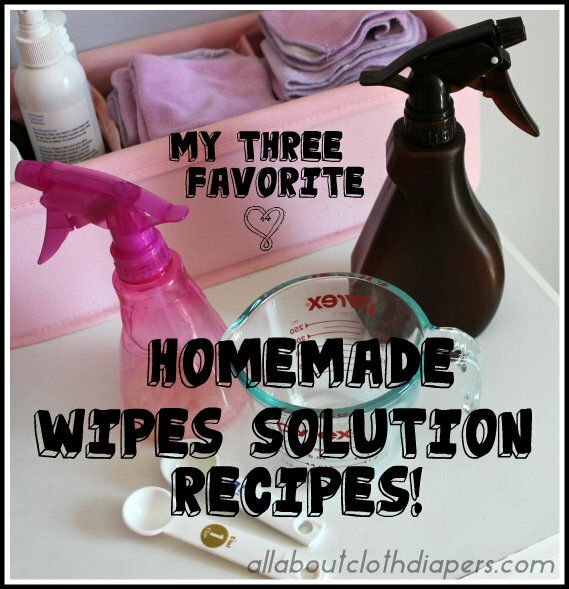 My Three Favorite Homemade Wipes Solution Recipes! 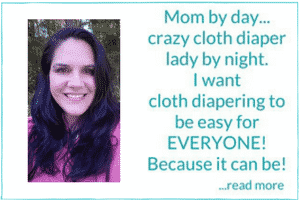 I often suggest that to make cloth diapering successful, you need to keep things as simple as possible. For me…keeping it simple means I use a concentrate like Lusa Baby Wipe Juice, mix it with water and add to a spray bottle. Viola! I have wipes solution! Not to mention that one bottle makes enough that it lasted a year and a half here. But I know lots of people want to make wipes solution at home. So here are three of my favorite cloth diaper safe wipes solution recipes! Just mix, add to your favorite spray bottle or wipes container and you are ready to go! There are 4 main ingredients in wipes solutions. Water- cleanses and dilutes other ingredients. IMPORTANT: Use distilled water or boil it first (obviously let it cool before use!). If you don’t at least use filtered water, you could run it through something like a Brita. This helps to prevent yucky things like bacteria from growing in the water. Oil- I have heard of people using baby oil. I don’t suggest this as baby oil is made from mineral oil, a petroleum based product. I prefer to use oils from my kitchen instead…coconut oil, olive oil or sunflower oil. Soap- helps to clean tiny bums of pee and poo. Many recipes call for baby wash. I prefer an all-natural baby wash, such as Earth Momma Angel Baby Shampoo and Body Wash. Plus, the Earth Momma has a natural, yummy smell. Many commercially available washes have ingredients that are as harmful as those chemicals found in some disposable wipes. Essential Oils- this step is optional. Also, do you own research on safe usage as there are certain oil that can’t be used with children. If you do use them go with a quality, organic and pure essential oil (i.e. Young Living or DoTerra) and dilute properly. (Use your favorite oil and soap) I suggest coconut oil and Earth Momma Angel Baby Shampoo and Body Wash or Dr. Bonner’s Organic Castile Soap. This is a good one for treating and preventing yeast infection rashes. Leave out the vinegar if using on raw skin, as it will aggravate it. You can play with different combinations of the oils or baby washes and shampoos to see which you like best and which works best for YOU and your baby. 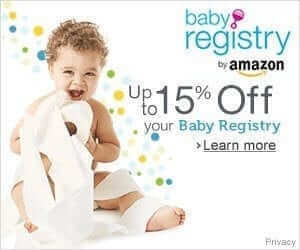 Just try to use organic and all natural ingredients, as they are better for baby. I would only make one small batch at a time. Some of these ingredients act as a natural preservatives (like vinegar or tea tree oil). If you are using what you make in a few months (3-4 months) you won’t run the risk of anything going bad before you have the chance to finish it. Any of you already make your own wipes solution at home? What is your favorite recipe? This is my firsg time even thinking about cloth wipes or even diapers but this will be my second baby. I was wondering if i could use the basic solution in a plastic wipe container instead of putting it in a spray bottle. Just thinking of ways to carry the wipes out with me also. You can put it in the wipes container. The only thing is sometimes people have an issue with them getting moldy. But if you use them the same day you should be fine. Hi! Is the basic solution for 1/2 of a roll of paper towels or for both halves? Hey Katy! I’m sorry, I don’t understand what you are asking. How many paper towels do you use for the liquid solution made? I don’t use paper towels. I use cloth wipes. What I do is keep it in the sprayer. Spray the bum directly and then wipe with the cloth wipe. How long does the basic solution last? Meaning, if I make one batch how many uses will I be able to get out of it? I’m trying to price out how much it would cost me to use a certain brand of oil… Does this make sense? Hi Sarahi! This will also depend on how heavily you use it. Mine personally last about 3 months. But this will vary from person to person. If the solution lasts about 3 months, how/where do you store it? My baby is due in 2 weeks and I want to prep the wipe solution now, but don’t know the best way to keep it fresh. I use a reusable spray bottle and just make whatever fits. When it runs out I make more. You can reuse one from something else. Or you can find spray bottles at places like dollar stores. Hi. I’m super late to this party, but I was wondering if I could exchange coconut oil for the olive oil in the last recipe. Hi Maggie, You could try it but at room temp the coconut oil could start to solidify. That wouldn’t happen with the other oils. If you make the switch, please let me know how it works out. Hey, Jennifer! I made the solution up this morning using heated Distilled water to melt the coconut oil, then added the tea tree oil and the shampoo. I couldn’t find the lavender on short notice, but will get it for the next go around (or get lavender shampoo next time since it’s already in there!). I put it in a quart canning jar and mixed it really well. Kept checking it as it cooled and shook it a few times. It’s definitely at room temperature now and the coconut oil hasn’t solidified. The jar still needs shaken as the oils are floating, but the shampoo kept the melted oil liquidy. It smells really good, too! I put some of the solution into a spray bottle to spritz the wipes when needed. I think this set up will work as bit better for us than our last one. I wanted to try out the coconut oil because I’d read elsewhere that it, like the tea tree oil, had anti-microbial properties and I think we were having issues with that with our last solution. Nasty diaper rashes kept cropping up no matter how we cleaned our diapers and wipes. Anyway, yet another post said that the soap would keep coconut oil from going back to solid. I liked the sound of your solution mix so I wanted to try the coconut oil with it. We’ll see how it goes and if we get any more icky rashes. I certainly hope not cause they had looked awful on my poor daughter’s baby bits. Also, I used an unrefined, organic, virgin coconut oil. Although I don’t know how much that matters in the grand scheme of things. Day two has shown a tiny amount of separation of the coconut oil in that there was some of the oil/soap foam stuck to the tube of the pump bottle when I just went to refill it. There doesn’t appear to be any separation in the main jar of it, though. Our little girl’s nether regions look great and don’t appear to be having any reaction or rashing, though. And those signs of rash prior to starting this new solution have vanished. Thank you for the solution (pun intended)! Update: I’ve had a little more separation of the coconut oil. Nothing terrible, but if it keeps up, it will probably clog the spray bottle eventually. The main jar still doesn’t have any separation, so I’m wondering if it’s just where we’re keeping the spray bottle or something. I’ll probably try out another kitchen oil for the next batch, though I’d have liked to stick with the coconut oil. Any suggestions other than olive oil? Thanks for suggestion, Tasha! I’ll check it out! Or if it clogs, run under hot water till liquifies again (can warm water in bowl, & float your sprayer till mixture melts again). Fractionated coconut oil is in liquid form at room temperature. I made the basic solution today with coconut oil, Burts bees shampoo and wash, and Gentle Baby oil blend from Young Living. After a few hours some of the coconut oil settled out though. I guess the soap wasn’t enough to emulsify it all the way? I shook it but there are still white bits floating around. It smells awesome and I love it otherwise! Hi Deborah, Sounds like you may be right. Perhaps add a tiny bit more of the shampoo and wash and see if that solves the issue! Thank you for the post! Can I use any of these solutions on babies hands and face? We’ve been using this formula since birth (LO is now 15 months) and we definitely use it to wipe her hands and face if need be. Thanks for this wonderful post. I appreciate that you’ve got a lot of experience in this department and spend your time sharing, which is why I come to you with my question. My husband and I having our first and we’re trying our very best by not being wasteful, so I picked up a few packs of reusable organic cloth wipes. We plan on removing reside with diaper, then a single disposable wipe (water wipe brand), then cleaning off with a cloth wipe. Do you think it’s necessary for me to make a wipe solution, like the basic recipe you’ve provided, or would distilled/filtered (or boiled) water in a spray bottle be enough after those two steps (in the scenario that the baby does not have any irritation or rash)? Thank you so much! I would say to skip the disposable wipe altogether. It’s actually easier than you think and it actually works better. Just made my own wipe solution. Any thoughts on pre-moistening dry disposable wipes and putting them in a wipe warmer? My wipe warmer is not for cloth wipes and I’d really like to use it. You probably could do that with the disposable wipes. But couldn’t you fold the cloth wipes to still fit in? Wish I knew about this when I had my children. Would have been so much better for their bots and would have saved so much money. Hello! Thanks for the awesome article. Do you know how long the wipes solution last for the Lusa Baby Wipe Juice? And do I use regular water or does it have to be filtered or boiled? I usually use my solution up in three months. So it’ll last at least that long mixed. I just use brita filtered water. I suppose you could use regular water, but depending on what’s in it, you may end with bacteria sooner. Is it supposed to say 1 1/2 cups distilled water, not just 1/2 cup? I made it and it seems very thick. The other two “recipes” call for 1 1/2 cups distilled water so I figured this could be a typo. Hey! Nope it’s 1/2 cup. You can of course modify the recipe to suit your needs. If you’d like it a bit thinner, add small amounts of the water until desired consistency is achieved. Okay. Thank you! I didn’t add extra water but what I did instead was first spray the cloth with water to get it wet then spray some of this solution on baby’s bum. Works great, thanks! I’m new to the cd, and would also start like to start using the cloth wipes. Where do you buy them or are they homemade. How long does the spray solution last and not get spoiled. If I want to make some that will last 3 months or more what ingredient should I add (or not add)? For the Earth Mama Angel Baby soap did you use the foamy pumped out stuff or pour the solution straihht from the bottle ? Can you add the soap to the Anit-fungal wipes solution? I did a search and all the antifungal recipes I could find didn’t include the soap. I’m not a chemist, so I’m unsure why. I know that isn’t an answer really. Since these are passed down from generation to generation like a food recipe, I think you might be safe playing around a bit (just like with food). Thanks for letting use know Leanne! Will this work to clean a dirty bum in a situation where you cannot bathe and this is for a adult.The CNA has not came for bathing services.I am trying to hold out sometimes and clean myself.I am paralyzed. I’m new to cloth wipes. After you apply the solution to baby’s bum and dry off, do you then apply anything else before fastening the diaper back on? For example, diaper rash cream, powder, or additional coconut oil…? So awesome I found this post! Love it! Pinning into my Pinterest! This is my first time coming upon this list. I use and love the Lusa baby wipe juice, but I like hearing what people use in their homemade formulas. Thanks for posting this article. I’ve been interested in trying homemade wipes. These recipes look great. I will try them out and see which one I like best. Thank you! I will let my sister see this post. It will save her money. Ooh pinning this!! I love that you included an anti rash and anti fungal one!! Do you use a spray bottle and spray their bum or soak the cloths? I just have folded washcloths in a disposable wipes container. I’ve never used them yet so not sure how to start! I use the bottle and spray their tush. Tgen use a dry wipe to clean it all. Thanks! We’re EBF so I’m just using water right now, but I’ll pin this in case we end up needing a solution! Can you recommend a particular brand of aloe? All I can find online is aloe gel or aloe juice drinks! Hi Alyssa, The cheaper the aloe vera gel the thicker and gloppier it is. So I would say to buy a little higher end bottle to avoid that. Or you can use less if you have one that is thicker. Hi. Can I use Aveeno baby wash? I tried one recipe with it that was 1 Tbs wash, 1Tbs coconut oil and 1 cup water. It was very soapy and I was afraid to wash the wipes with my diapers which defeats the purpose to me. If I up my water will that fix my problem or do I need to get Castile soap? Thanks for any input! I haven’t personally made a mix with aveeno. But washes are designed to be soapy. You’d likely always have an issue with the suds. The only thing you can do is try using less of the aveeno, or maybe try something else. Thanks. What is Castile soap exactly. What so special about it compared to other soaps? True castille soap uses 100% olive oil and lye, that’s it (with maybe some fragrance added). Most brands of castille soap (like Dr. Bronners) incorporate other oils into their recipes, but the majority oil should still be Olive to be able to call it castille. Olive oil makes a gentle soap and is considered to have low cleansing properties (which means you are not stripping away so much of the skin’s natural sebum) which is why it is so popular for baby products. Question: Can I wash cloth wipes with my diapers? Or will the soap and oil be an issue? I’ve been cd for over a year now and have just started with the wipes. It’s a pain to have to keep disposable wipes seperate from the diapers (if they’re poopy). Absolutely! :) Everything is washed together. Keep it simple right? Thanks for this post! I’ve been using Kissaluv’s concentrate (only adding a little bit of witch hazel, mostly water) and couldn’t figure out why it kept growing things!! The instructions on the concentrate didn’t say anything about using boiled or distilled water. I’ll definitely try that next time! Hi There!! If I wet the wipes using the 3rd solution recipe you have and put them into a wipe warmer container, will they stay or am I better off just leaving them in a spray bottle? Thanks! As part of our nap and bed time routine I like to wipe down my Daughter’s face and hands with a warm wash cloth, and I also use cloth wipes for her bum. We live in a very dry climate, so being gentle with her skin is a big consideration. Do you think it would make more sense for me to use a wipe without soap for her face? The shampoo I use is Weleda Baby Calendula shampoo & wash. Thanks for the great recipes! I’ve been looking for confirmation that Coconut oil is a good choice! Hi Amanda! I think that if you’ve been doing it all along and haven’t had any issues, then there’s probably no reason to change it now. Do you start with the basic solution then add the other ingredients? Or can you just make a batch using the ingredients listed without adding to the basic solution? I use 2 drops tea tree, 2-4 drops lavender( depending on spray bottle size) and 2 tbsp’s of witch hazel(with aloe) and fill the rest of the bottle with warm water. I keep my wiped dry and folded into a wipe container. Yay! Thanks for this post! I’m really excited to have found your blog as I am due in two short weeks with my first babe and planning on going the cloth route. As far as wipes solution goes, would I be able to prep a big batch of one of these and then store it in mason jars? Or is there a certain amount of time that the solution stays good for? Hi Jordyn, The ones with Tea tree oil might be ok as that is an antimicrobial. How much were you planning on making at a time? Great info! If I use soap in the solution, is it necessary to rinse/wipe after with just water or is it mild enough that there is no need? You are only using a little bit of soap, so all you have to do is wipe dry and you are good to go Anna. Hi Christine! I think added a few drops of tea tree oil could solve your issue. Adjust amount according to how much solution you are making. You could also make a larger batch and freeze it in daily use quantities (and use one of those ice cube trays that makes long skinny ice cubes if you use a spray bottle). What about essential oils besides lavendar? My mom and I are both allergic to lavender (and daddy can’t change the diapers 100% of the time). I love using 2 cups of water, 2 Tablespoons of doterra fractionated coconut oil, 3 drops doterra lavender oil and 3 drops doterra roman chamomile oil. So simple, I fold my wipes into a container and pour the solution on top and send to day care for the week. I do another for home. I use the Oxo wipes container, no mildew at all and great scent on the babies bum. Sunday I make both containers and I’m set for the week. How do you keep the coconut oil in solution? Hi Diana, Once the coconut oil has been melting and mixed in the solution it should stay in a liquid state. Just give the sprayer a good shake before each use and you should be good to go! Ah I see. Good to know! Thanks. I just keep my wipes dry and wet them as needed, but have thought multiple times about using a solution amd putting them in a wipes box. Thanks! I still keep my wipes dry and use the solutions in a spray bottle. It works great for us! Also good for the diaper bag. You can use the solution in a wipes container with great results as well! Hi there! I have a question, I am a reusable wipe user and I just use warm water out of the tap. This is the first time I have heard to use distilled… why is that so important?